It occupies an area of 36,940 m2, with 2,220 m2 in the mezzanine and 8,680 m2 distributed over 4 floors. It has different heights: 4.2 m on mezzanine, from 10.1 to 11.3 m on 1st and 2nd floor, and 8.4 m between 2nd and 5th. The slab thickness varies between 300 mm and 380 mm. 750 mm slabs and column heads were built with VR Tables. 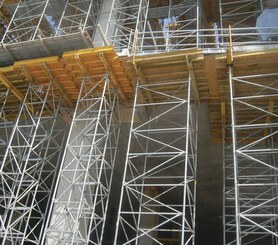 The great height required shoring with T-60 in different modulations (1 m, 1.5 and 2 m). 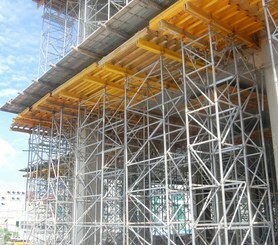 The post-tensioned beams of 3000 x 1200 were also supported with tables and shored with T-60.